The bride wore one of the most historic sets of jewelry in the Swedish royal collection: the Cameo parure, which almost certainly belonged to Joséphine de Beauharnais, the first wife of Napoléon Bonaparte. (Read all about the tiara's journey from imperial France to modern-day Sweden in this post.) The tiara has become a traditional bridal tiara for the women of the Swedish royal family. Victoria wore the tiara, which features cameos that tell the love story of Cupid and Psyche, as well as the earrings and the bracelet from the set. She also received a new piece of jewelry on her wedding day, as she and the newly-minted Prince Daniel exchanged wedding rings. Victoria was married on her parents' wedding day; she also wore the same tiara and veil that her mother had worn on her own wedding day more than thirty years earlier. For her daughter's wedding, Queen Silvia wore another grand sparkler from the Bernadotte vaults: the Braganza Tiara, made in the late 18th century and then altered in the 1820s for Empress Amélie of Brazil. Amélie later bequeathed the tiara to her sister, Queen Josefina of Sweden and Norway, in 1873, and it's been with the Swedes ever since. Silvia also wore another set of heirloom jewels at the wedding: the pink topaz demi-parure, which was made in Russia at the turn of the nineteenth-century and came to Sweden years later with Victoria of Baden. She's also wearing the Order of the Seraphim and her husband's family order. The sister of the bride, Princess Madeleine, wore a family heirloom tiara for the first time at the wedding: the Connaught Diamond Tiara. Given to Crown Princess Margareta of Sweden by her parents, the Duke and Duchess of Connaught, as a wedding present, the tiara later became known as Princess Sibylla's Tiara, because it was a favorite tiara of Madeleine's grandmother. Queen Silvia is the usual wearer of the tiara, hence the brown velvet-wrapped base. Madeleine also wore the Processional Jewels, an important heirloom Swedish necklace. It was given to Victoria of Baden in 1881 to mark her procession into Stockholm following her wedding to the Swedish crown prince. The necklace is set with Sri Lankan sapphires, diamonds, and baroque pearls. Additionally, Madeleine wore the family's small diamond bow brooch to secure the Order of the Seraphim, plus pearl earrings and her father's family order. The king's four sisters also attended their niece's wedding. The eldest, Princess Margaretha, wore the diamond and aquamarine kokoshnik that belonged to her mother, Princess Sibylla. She also wore the tiara's coordinating brooch, plus a diamond necklace, diamond and aquamarine earrings, the Order of the Seraphim, and her brother's family order. The king's second sister, Princess Birgitta of Sweden and Hohenzollern, wore Queen Sofia's Tiara. Her sapphire and diamond necklace was inherited from her mother, Princess Sibylla, who received it as a wedding gift in 1932 from her uncle, the Tsar of Bulgaria. Birgitta also wore a stack of diamond bracelets and diamond earrings, as well as the insignia of the Order of the Seraphim. Princess Désirée donned an amethyst tiara made from a necklace that belonged to Queen Josefina of Sweden, plus diamond earrings, a diamond necklace, the Order of the Seraphim, and her brother's family order. The king's youngest sister, Princess Christina, wore the family's diamond six-button tiara, made from diamond rosettes that once adorned the coronation crown of the first Bernadotte king. She also wore a pearl choker with a diamond clasp, the Order of the Seraphim, her brother's family order, and two more medals: the medal made in honor of her brother's 50th birthday, and the Prince Carl Medal, which she received in recognition of her humanitarian work. Queen Sonja of Norway brought an important suite of jewels back to Sweden for the wedding: the emerald and diamond parure that once belonged to Queen Josefina of Sweden and Norway. With the emeralds, she also wore the Order of the Seraphim, plus her husband's family order. Princess Ingrid Alexandra of Norway, one of Victoria's godchildren, was a bridesmaid in the wedding -- here she is with her parents, Haakon and Mette-Marit. Rounding out the Norwegian contingent was Princess Märtha Louise, who borrowed her mother's amethyst parure for the occasion. Like Mette-Marit, she also wore the Order of the Polar Star and the star of the Order of Saint Olav. Queen Margrethe II of Denmark, who is the daughter of a Swedish princess, wore a tiara that once lived in Sweden: the Pearl Poiré Tiara, which was owned by Queen Lovisa of Sweden and Norway. She also wore the other diamond and pearl pieces which are generally paired with the tiara, including the necklace that was a wedding present to Queen Louise of Denmark from the Khedive of Egypt. Margrethe also wore the Order of the Seraphim, the star of the Order of the Elephant, her father's family order, and the ribbon and badge of the Order of the Dannebrog. Crown Princess Mary of Denmark also wore jewelry with Swedish roots: the ruby parure that originally belonged to Désirée Clary, the first Bernadotte queen of Sweden. This was actually the event where Mary debuted the recently remodeled version of the set, which now includes a pearl option for the earrings. She's also wearing the Order of the Polar Star, the star of the Order of the Elephant, and her mother-in-law's family order. Prince Christian of Denmark attended the wedding with his parents, Crown Prince Frederik and Crown Princess Mary. He's one of Crown Princess Victoria's godchildren, so he was a member of the wedding party. Princess Benedikte of Sayn-Wittgenstein-Bereleburg is the daughter of a Swedish princess and the sister of the Danish queen. She wore the glittering diamond tiara of the S-W-B family, plus diamond earrings that belonged to her mother, Queen Ingrid, a diamond necklace that belonged to her grandmother, Queen Alexandrine, and a sapphire brooch that belonged to Princess Thyra. She's also wearing the Order of the Polar Star, her father's family order, and the ribbon and badge of the Order of the Dannebrog. Benedikte's elder daughter, Princess Alexandra of Sayn-Wittgenstein-Berleburg, wore her mother's floral birthday tiara, plus a gold, pearl, and emerald necklace that also belongs to Benedikte. Princess Nathalie of Sayn-Wittgenstein-Berleburg, Benedikte's younger daughter, borrowed a Swedish tiara from her mother's collection: Queen Sofia's Star and Pearl Tiara. She paired the tiara with a pearl necklace and pearl earrings. Carina Axelsson, the partner of Benedikte's son, Prince Gustav of Sayn-Wittgenstein-Berleburg, wore a diamond spike tiara and glittering earrings. Queen Anne-Marie, Danish princess and former Queen of Greece, wore the gorgeous Greek ruby parure for the wedding. The set has a distinctive olive wreath tiara. Anne-Marie doesn't have a Swedish order, so she's wearing her highest Greek order: the Order of the Redeemer. She's also wearing the Commemorative Badge of the Centenary of the Kingdom of Greece. Anne-Marie's eldest daughter, Princess Alexia, wore her diamond tiara, as well as pearl drop earrings and a pearl and diamond brooch. Like her mother, Alexia has no Swedish order, so she's wearing her highest Greek order, the Order of the Redeemer. Tatiana Blatnik, who was still a few months away from her own royal wedding, didn't wear a tiara at this wedding. Instead, she paired her gorgeous gold-flecked gown with statement earrings. 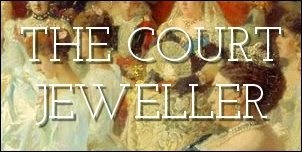 Stay tuned for Part Two of Crown Princess Victoria's wedding jewels tomorrow, and check back here later today for a rundown of the week's royal jewels!